Ken Russell died .. Boooo!... He did some rad stuff! 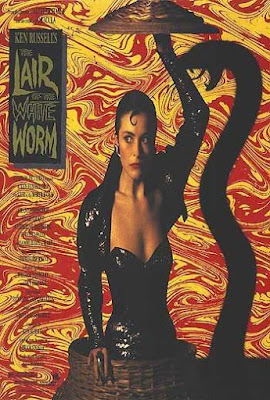 He also did LAIR OF THE WHITE WORM which Ive NEVER EVEN SEEN but I had the POSTER on my wall growing up because I thought it was SO AWESOME! It was like LISA STANSFIELD popping out of a basket in black lame'! I never met Ken Russell but my friend did and said he wanted to make a movie about people air dropping kittens with parachutes on jews trapped in concentration camps but because theyre so starving they dont keep them as pets but tear into them like ROTISSERIE CHICKEN! OH?! My friend Quinn was also quick to remind me Ken Russell gave us this. Probably one of the most bizarro moments ever captured on film. BARF now I CANT eat dinner! Ken- RIP my favorite director. As you say, there are some wonderful lines in Crimes of Passion, specially Kathleen in her stewardess persona telling her trick that "while we may run out of PanAm coffee there's always plenty of TWA tea. He was certainly one-of-a-kind and well worth watching. TOMMY is a classic.